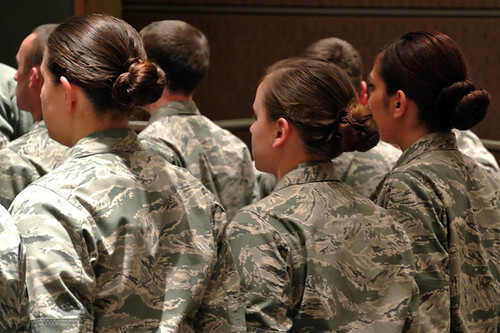 The news has been all a buzz with the news of Panetta lifting the ban on women in combat. My initial reaction was, “well, aren’t they kind of already there?” To me, it became very apparent they were when Jessica Lynch was captured. You don’t get captured not being in the thick of it. We have women every day traveling in convoys, armed to the teeth, ready to fight alongside their brothers. We have women pilots, getting it done! I realize that “in combat” technically means downrange and on the front lines; but the lines are kind of blurred these days, and “down range” is really everywhere. It may come as a surprise to those that know me or read my personal blog, that I’m cool with this. I would be the first to tell you that I’m pretty conservative, as well as being pretty old-school. However, a lot of the world isn’t and there are women serving in the military of their own volition and not by draft. Several months ago a news piece popped up about women being allowed into the ranger training program. That’s when I really started thinking about this topic. My hubby, who is pretty smart about these things, explained to me that there are a lot of people that use the Ranger program as a way to further their military career, with no intention of joining a Ranger Unit. My brain burst into flames at this point. I had absolutely no idea that that happened. Now that I know that, it would only make sense to allow women to participate. Why should they not reap the benefit of it to further their career? A man that posses that will automatically be chosen over a women with the same accolades. The problem for me comes in when we look at the requirements to achieve that goal. There is a reason why women previously haven’t been allowed into Special Forces, or combat zones. I’m sure many people will argue that a women’s emotional sensibilities have been involved in the conversation; but let’s just put that one aside for moment. The bigger issue to me is the physical requirements. If you were to ask me I would tell you that I don’t think there should be different in them, combat or no combat. If you want to have different requirements for someone that works in finance or admin that’s fine, but if you’re being deployed to a war zone, you need to be ready. This would be especially true if you were going to become a Seal or an Army Ranger. There is no way that a woman should be allowed to be in either one of those unless she can do the same thing that her male counterpart has been doing all these years. It’s not about being sexists, it’s about the safety of themselves, their brothers in arms, and those they are to rescue. The Coast Guard (and Navy) has it right. I knew that women were a part of the elite Rescue swimmers, but I didn’t know the whole story. While doing some research on that part, I came across several articlesand fact sites. There are currently four female rescue swimmers in the Coast Guard. Did you know they were asked to do and did the exact same things that were asked of their male counterparts? Go Coast Guard. Why should they not have to do the exact same thing? They are under the same stressors and rescuing the same people. The first female rescue swimmer for the Coast Guard was Kelly Larson “nee: Mogk”. Ms. Larson retired in 1999, having received numerous awards, including the Air Medal and an in-person congratulations from President George H.W. Bush. You can read about another rescue swimmer, Sarah Faulkner, here, who was instrumental in several rescues during Katrina. While I personally may not be signing up for Rescue Swimming or the Army Rangers any time soon, I’m all for women choosing to do that. However, having the same physical requirements should be the first thing we discuss in the coming days. To not discuss it would only set women up for failure and possibly be putting their fellow Soliders and Seamen in danger, as well as those civilians around them. More importantly it would be a slap in the face to those women that have stood toe to toe with their elite counterparts in the Coast Guard and Navy Rescue Swimmer Programs. Women can do what men can do, sure, but they have to be able to do what men can do. I tweeted something along these lines earlier. Women have been fighting in combat for years! Not necessarily as Infantrymen, but definitely in combat-support positions. Hubs is an MP and many of the women that were deployed with him last year were blown up, shot at, shooting, patrolling, etc. I completely agree with having the same requirements. If you want the job, you should be able to do it like everyone else. I have to agree with this. Up until now, there are no women except for a one or two Officers that are in my husband's unit. This will be opening it up to where there can be now. I have no problem with that as long as they can do the same thing. It needs to be the same physical requirements as the men. If the women can accomplish the same thing, then go them! If they can't, then they need to find another job. I don't want my husband's life on the line because the person with him can't carry him to safety if something was to happen. I also agree. If you want to have an equal job you have to be able to do it equally well. Found you through Bloggy Moms.